Tomboy opens up with a four year old Liz Prince throwing a temper tantrum over having to wear a dress. Much of the book continues on with Liz growing up hating dresses, enjoying toys meant for boys, and having trouble fitting in at school with the other girls. I do have to admit, I love Liz’s love of the Ghostbusters cartoon. The story talks about how Liz finds that she’s a tomboy. She likes things that are deemed masculine by our society. She feels a lot of hatred for feminine things. Unfortunately, this means that Liz gets made fun of a lot by her peers and has trouble finding a boyfriend, which is one of her goals in the book, it seems. Yet, through trying different schools and eventually volunteering for a community center sorting zines, Liz finds her place. So, I feel like this is a book about acceptance — about being confident in yourself, about eschewing society’s gender constructs, and about simply being yourself. WHAT DID I ULTIMATELY THINK OF TOMBOY? Liz Prince’s memoir really made me think. At first, I was like, ugh, what is the big deal about wearing dresses, it’s not that bad. For real, I thought the book went on and on about that overmuch. But then it’s like this switch went off in my head and I realized, she’s got a point. I began to realize that as Liz was growing up, like 5 years before me, she didn’t have a whole lot of strong female role models in the media or in commercials. Society had dictated females look and act a certain way. And so, Prince rebelled against that because she states in the book that she’s strong willed. I have to say, that some of it I could relate to. Like, when she’s talking about Disney and how the princesses all have to be saved and how that didn’t appeal to her, and how Princess Leia needing to be saved also didn’t appeal. I totally get that. As I was reading, I was thinking about when I was a kid and how I would get up at 7:30 a.m. to watch Sailor Moon on Fox Kids 40 because it was subconsciously the only show on TV geared at girls my age featuring females who don’t need saving but who have power and are the heroes, of course I also liked it because the Sailor Scouts were also allowed to be feminine (I have zero dress hang ups, obviously). 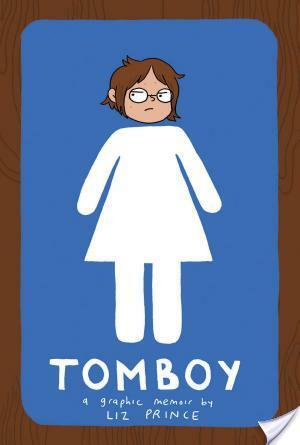 I guess Tomboy just really made me reflect back on the gender socialization in my life. I could honestly see this book being used in a gender studies class, and to be honest I wish that I was still in contact with my gender studies professor so that I could send this book to her. So, at first I didn’t love the art because it’s not super detailed. See, there’s a lot of at firsts when it comes to this book. But, you know, I kept reading and I began thinking that the art is perfectly suited for this book. Tomboy is a book about someone who is not ostentatious. It’s about someone who doesn’t seem to care for all these adornments. And so, the art within is unadorned. It’s art that looks deceptively simple (but is totally not) and well, I thought that was a good thing because it allows for greater focus on the story and beyond that, the meat and meaning beneath the surface story — about our gender roles and how it’s affected growing up. She talks a lot about boys and crushes and so, I thought of Becky from Little Giants and her crush. I have never read a graphic novel and I have been looking for one, this one look interesting. I have been asking my students for some ideas as I wanted to branch out into different genres. I considered myself a tomboy growing up and I liked the idea of the simple illustrations. Thanks for the review. I’ve only read one graphic novel (I know, I don’t know what I’ve been doing with my life) but I absolutely LOVED it. It was Through the Woods by Emily Carroll, and it was more than anything I could have hoped for in a book like that. So I am really interested in reading more graphic novels, especially memoirs, because I think that might be something I’m interested in working on over the course of my life! Unfortunately I’ve only read a few graphic novels but I’m starting to slowly read more an more. 🙂 My favorite is Saga Vol. 2 by Brian K. V. Thanks for the giveaway!